This fish is simply delicious. The flesh is like butter and the flavor is from heaven. I know that sounds extreme, but it's true. I was in Costco and the fresh fish counter had whole black bass. I'd never made it before, but the woman behind the counter said it is similar to yellowtail (hamachi) which is one of my favorites, so I had to try it. I wanted to grill it, but the best recipe I could find was for an asian deep fried version from Wolfgang Puck. I adapted it for the grill, and I honestly can't imagine it could taste any better fried. This was awesome! If you try it, you will not be disappointed. (Warning: This fish is messy to serve. I recommend you serve it whole like I did and use a large spoon to let people spoon the flesh off the bones and onto their plates. The bones aren't small, so it's not dangerous. Just a little messy.) We served it with steamed jasmine rice, grilled asparagus, and kimchi. Make four deep incisions (to the bone) into each side of the fish. Insert the pieces of ginger into the incisions and refrigerate fish until ready to cook. In a small sauce pan, combine the sake, soy sauce, lemon juice and about 1/8 tsp corn starch and bring to a boil. Then remove from heat and stir in the scallions. Generously sprinkle salt an pepper over the fish and spray (or rub) the outside with olive oil. Put the fish in a large fish basket, close tightly, and place the fish basked on the grill. Grill for 6 minutes on one side (with grill closed over basket). Then flip and grill for 6 minutes on the other side. Check for doneness. Fish should be firm but still somewhat soft. 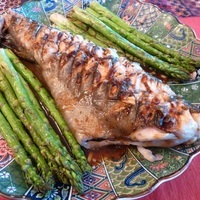 When done, remove fish from grill, place in a large bowl, and cover with the sauce from the sauce pan. Sprinkle with optional cilantro, scallions, and extra lemon juice. Hi Ronda...thanks for the comment. I hope you get a chance to try it. You'll love it! This was absolutely delicious. The fish just melts in your mouth, and the sauce is a wonderful complement. This sounds awsome.I can't wait to try it. I don't think it sounds weird at all what you said.that is exactly how i felt when i lived in Baltimore and ate blue crabs that's just how they taste to me.so I know I will love this receipe.in fact ur descrption is why i want to try this.oh thanks for following me I did the same for u.I have lived in ca.u get very good fresh produce there hopefully when i move to fl.soon i will have that in abundance too. This sounds nice! i like grilled fishes!